For those considering a career in Electrical Engineering, our undergraduate program offers excellent opportunities to explore and study the diverse areas in which today's electrical engineers work. Whether you want to explore the autonomous vehicles like the Mars Exploration Rover or the new cutting-edge robotic technologies, design flight control systems for the next generation of aircraft, develop new instruments for biotechnology, design, develop the communication networks and mobile products of tomorrow, or study the digital circuits which are the building blocks of most products, Electrical Engineering at Hampton prepares you for exciting careers in almost every high technology field of today and tomorrow. 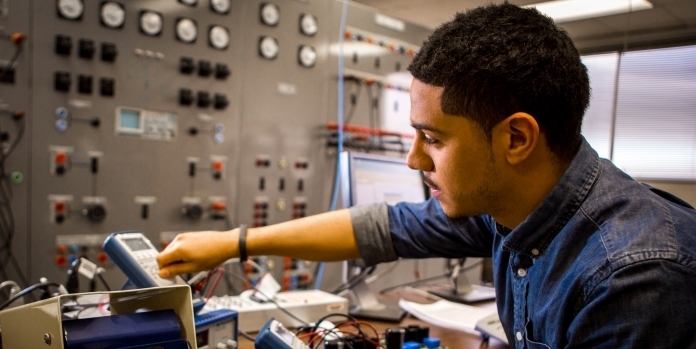 Electrical Engineering program covers many areas including digital systems, communications, control systems, energy conversion, microprocessors, computer architecture, electromagnetic waves, and computer engineering design. The mission of the Electrical Engineering program is to provide a state-of-the-art, academically enriched environment for students such that they will acquire the knowledge necessary for entry-level positions as professional engineers and/or for graduate school. Along with a technical education, our graduates are prepared to cultivate a capacity for creative and dynamic problem solving, and to foster a desire to contribute to the culture and society in which they live. The Electrical Engineering program educates problem solvers with a high level of technological competency and social responsibility. Furthermore, all students will have developed the skills and acquired the basic knowledge necessary to be successful in graduate study or for the entry-level positions as electrical engineers.